Art Edwards - Laying Down the Law: Because What's Weirder than Alex Trebek? About five years ago, I sat down to write a story about Alex Trebek. This story would be different from so many of my other short stories because it would come from an idea. I didn't write from ideas. I didn't like ideas. Everyone had ideas. I wanted to be different. My idea was I wanted Alex Trebek to show up to an apartment complex, squat down, and sort of study the distance from this position. Think of it as a contemplative pose. He'd grab his lip, absent-mindedly pinch it, look off into the distance, and stay there for a long time. I just wanted his presence in this pose in this story, kind of like the old man in "A Very Old Man With Enormous Wings," but I wanted it to be Alex Trebek, and I wanted him to be squatting, and I wanted to see what would happen. This is why writing is so wonderful. You decide you want things a certain way, and that's the way they are. At one point, the story was called "A Very Old Game Show Host with Enormous Wings." I just wanted it that way, and it was so. So, I wrote the story, and I liked much of it, and didn't like other parts of it, so I rewrote the other parts several times over the course of about five years, and eventually I had a story, now called "Waiting for the Question." That was when I heard about Forest Avenue Press's City of Weird anthology. 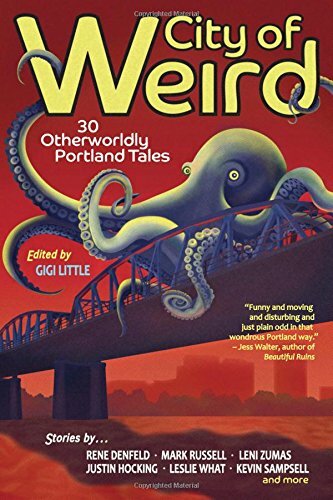 What you need to know now is Forest Avenue Press's City of Weird anthology is available for sale, and it's where you can read my Alex Trebek story "Waiting for the Question" and 29 other stories all set in Portland, and by some very respect fiction writers. It's a real honor to be included, and I think, somewhere, Alex Trebek is happy about it too. So, please buy the anthology and read my Alex Trebek story and get 29 other Portland stories to boot. Also, there is a series of readings coming up to celebrate this offering, and I'm participating in two of them. However, the official launch party is this Wednesday at Powell's on Burnside, where my writing compatriot Mark Russell is reading with three other City of Weird contributors. I won't go into all of the revelry scheduled for the event, but let's just say it feels very much like you won't want to miss it.